Did you know there are no casinos in Japan? In fact many forms of gambling are not allowed and though there are discussions to legalize gambling in Japan, nothing has been made certain. The first time B and I visited Tokyo about 3 years ago, we were both excited at the thought of checking out a fancy casino or two while we were visiting. We felt so silly when we discovered there were actually no casinos in Japan! 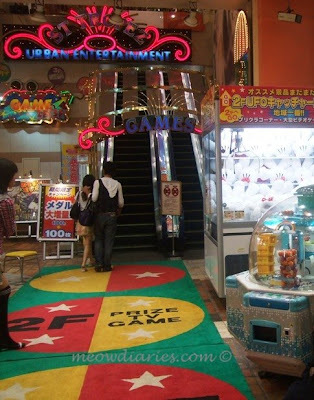 Instead, there are many Pachinko Parlours and entertainment centres with the latter offering plenty of fun in the form of games especially the famous UFO catcher. And today, I am taking you to this very cool entertainment centre we visited in Akihabara. B and I spent quite some time playing all sorts of games here and trust me; there were plenty to keep us busy! This is my favourite game, which I call the Perfume Machine! Check out the many different perfumes I stand to WIN! 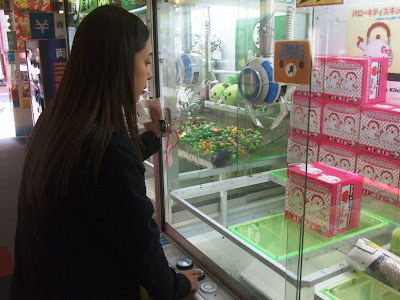 Depending on the prizes and the type of game, it costs 100 yen for 1 to 3 tries and 500 yen will get you 3 to 5 tries. You are supposed to manipulate a joystick that controls the claw, allowing it to move back and forth and sideways. 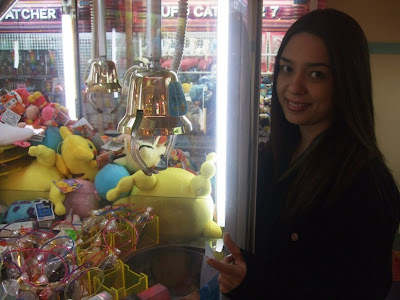 Once you have your claw position set, it will descend and attempt to grip the prizes in the display case. If you're lucky, the claw successfully grips and drops your prize into the hatch for you to happily collect! It sounds easy but it's really not; there were many frustrated moments when I almost won but the prize fell off the claw at the last minute. Let's not even discuss how much I spent playing these games! 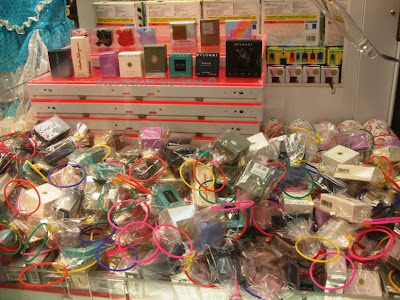 So many perfumes waiting for me to WIN them home! This one here is another perfume machine and it's easier to play compared to the UFO catcher. Basically I just have to press the stop button at the right time, in hopes of having the perfumes (and not the plush toys) pushed down into the hatch. Check out the short video clip of Mariuca losing! In the end, we did WIN a few cool items and B won one miniature perfume for me so it was really a lot of fun! It might not be the bestusaonlinecasinos.org we were hoping to visit but it was still very exciting. The thrill of winning something was what we came for and that much we certainly got! Oh and we were lucky enough to catch the famous Rilakkuma Bear who happened to be around that day. I quickly grabbed him in a bear hug and so did B! i just reached home!!!! tak letak beg lagi ni!! i terus saw the tweet and chop!! awww.. hahahaha!! looks like so much fun, marzie!!! :) :) i can feel the excitement + anxiety + panic watching you play that game!! LOL! Recent blog post: Shop Smart with Coupons! 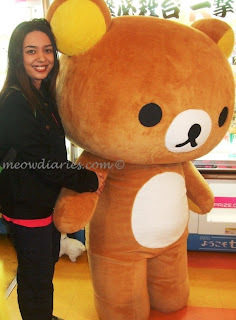 I also want to bear hug the Rilakkuma bear!!! LOL @ jeanie being karat!!! LOL! Hahahahhahahah tak letak beg lagi kelam-kabut chop it seems Shemah!!! Nasib J tak Nampak hahahaha! macam best kan debbs??? jom pi!!!! :'( :'( :'( I'm too late again! He he he thanks Mon! Must hug the bear of coz, bila lagi ada chance? LOL!!! hahahaha J nampak and just geleng his head at me. buka kasut, masuk pintu, check my tweetdeck and kelam kabut chop!!! THEN only i help him bring the stuff inside!! LOL! Hahahahaha bestnya!!!! Like B also panic like that!!! LOL! Tu la I pun tak paham Debbs speaking ni!! Recent blog post: Kuching, Here I Come! Congrats Shemah! And again u’ve put urself in the running to be my TFC2! Both tied at 3 points! Meow! Hahahaha me too Jean!!! I can play it all day… and night!!! Hahahah mmg best pun Shemah, pi la Japan!!! Just chopped this one this morning Ane, yay for RM casino PBs LOL!!! Hahahhahahahhahah I can imagine J geleng kepala kat u Shemah! Sometimes B oso thinks I’m crazy when I suddenly tune him out to CHOP while talking to him hahahhahahah! Cian our hubby LOL!!! day, I also want to find him!! Or her!! LOL! Hahahahahahha dua2 panic la , so farnee la we two and then some more can influence another guy (who tak pernah main the games) to join in the fun hahahahhahahha! yes, mon! it means TQ! Oooops both here referring to u and Mon, Shemah! 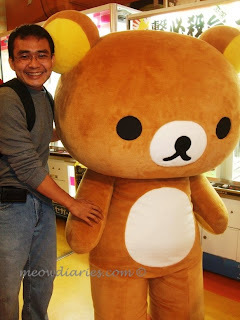 Pemes gila the Rilakkuma bear, semua org rushed to snap pictures with him, I oso had to kelam-kabut hug and take pic LOL! Sure Jean, I have faith in you! Yeah la cause u donno his name, pakai bantai je he hehhehe! Aloha Miss Y! Wah long time never say that to u woman!! Hey TH! Sure la fun, ha ha got perfume machine and bear how not to have fun LOL!!! Hahahahahaaha a girl's gotta do what a girl's gotta do!! Memang kesian lah..
but it's like reflex when I see a chop tweet! LOL! Wuaaahhh speedy jeanie!!! Takut lah like this!! LOL! kids' lari ikat kaki comes to mind!! LOL! Im not doing my ec although I should cause it’s the last day huhuhu! Oh no im left behind today huhuhu 900 to drop aiyo! I am trying to drop some before I zzzz oh no haven zzzz! Dats why haven zzzzz now happily dropping ec it seems LOL!! was.. if not.. no TC and TD like this!! LOL! wah.. you won that big stuff toy! awesome!!! my internet can go anytime now.. now.. so just making full use of it before it goes!! Don forget to check on TD oso peeps! Sure I tak full 31 days! LJ!!!!! U mean the Rillakuma Bear??? Hhahahahahahhaha mana ada I menang tu LJ? Hahahhahahhahaha oh bestnye kalau I menang tu! Jean!!! I just woke up ha ha, thanks for voting sweetie, up against my bes fren castaway it seems!! meow! wah the toy so big! The bear u mean TH? He he, of coz la big, somebody’s inside the bear suit LOL!!! The big “toy” is for show la TH, obviously I can’t win the bear hahahahha, I wish though!!! Hahah.. yelah.. human size tu!!! Bestnya! Thanks for the screen capture GP!!! Muahs!! U asking me to go on one LJ? He he BOTB! Mmg best to hug LJ! Tak nak lepas lol! What still got LJ? MCS?????? Hmm.. still got what eh? Internet kot!! Ahhaha. if you go on.. I vote lah.. just now I saw Jean say she voted. I’m back dearie! Why la suddenly hehehehe! Hahha.. must be laughing at one of the comment lah.. lol!! want to do cannot.. coz any time can disconnect kan? Tu la… I hari tu pi DU punya branch to terminate and they terminated immediately.. Cuma nak reconnect tu je yg buat hal. Buat la sikit sikit LJ while u still have connection! GP! My MIL also speaks Japanese.. she took course coz my FIL got business with Japanese and too lazy to took the coures.. lol! Recent blog post: We Are The World.